credit to Evan for the title! 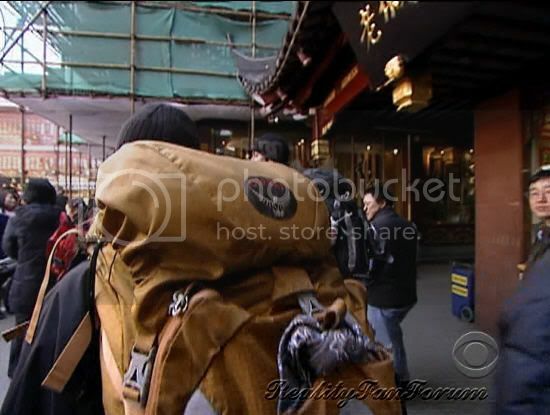 "They Don't Even Understand Their Own Language" (Shanghai) - The Final 4 teams struggle with the language barrier in Shanghai while sorting through hundreds of golden Buddhas and thousands of Chinese stamps in their pursuit for a spot in the Final 3, on THE AMAZING RACE, Sunday, May 2 (8:00-9:00 PM, ET/PT) on the CBS Television Network. Phil Keoghan is host. Work in progress! Will be updated as we know more. Pictures are thumbnails, click-click to enlarge. Items in red can be clicked for further info. HUGE thanks to our insider local and to swoonist and to Slowhatch for the original swoonist blog find!! Teams remain in Shanghai following a 12 hour Pitstop. Cowboys, Models, Brothers, and then Cops. 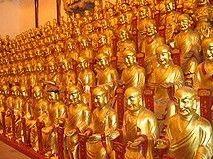 Longhua Temple (Chinese: 龙华寺; pinyin: Lónghúa Sì, literally "Lustre of the Dragon Temple") is a Buddhist Temple dedicated to the Maitreya Buddha located in Shanghai, China. Although most of the present-day buildings date from later reconstructions, the temple preserves the architectural design of a Song Dynasty monastery of the Buddhist Chan sect. 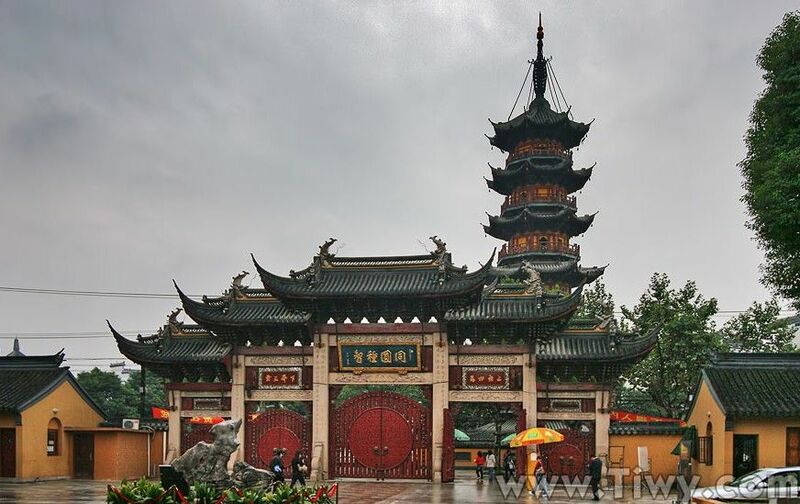 It is the largest, most authentic and complete ancient temple complex in the city of Shanghai. Would be fun if we saw something like this? 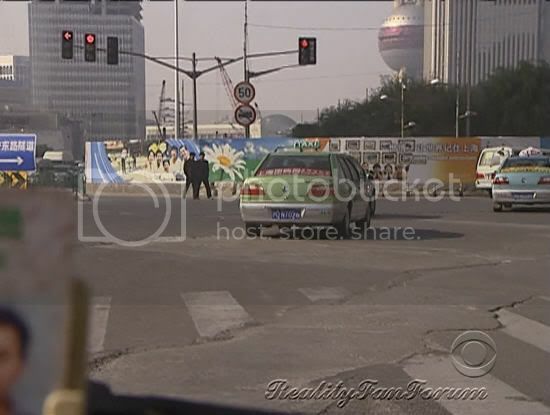 Teams were originally supposed to travel by taxi to the "High Fashion" Roadblock, which I suspect has been transformed into the "Fashion" Route Marker scheduled for episode 10. Lujiazui Central Green is located in Pudong district in Shanghai. The Greens are situated at the entrance of a Tunnel where you could come across a group of huge steel structures named ‘Spring” which resembles eight flowers in full bloom. This is the largest space which has been opened up by the Shanghai Government. Some of the evergreen grass has been imported. Lujiazui Central Green covers an area of approximately 100,000 sq metres out of which 65,000 sq meters are covered of an evergreen turf. The shape pathway resembles the city flower of Shanghai, Magnolia. 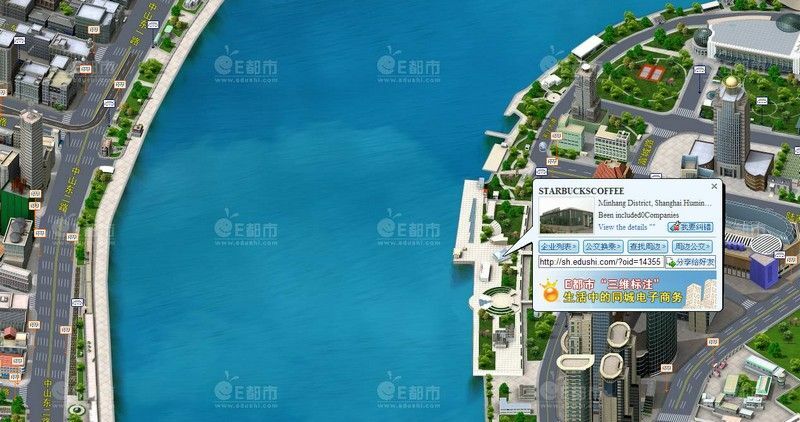 The center of the Lujiazui Central Green features a man made lake which covers an area of 8600 square meters. The lake resembles a map of the Pudong new area. There is a fountain in the centre of the lake that can spray water columns as high as 80 meters. There is a white scenic canopy on the banks of the lake which resembles both a conch and a shell. 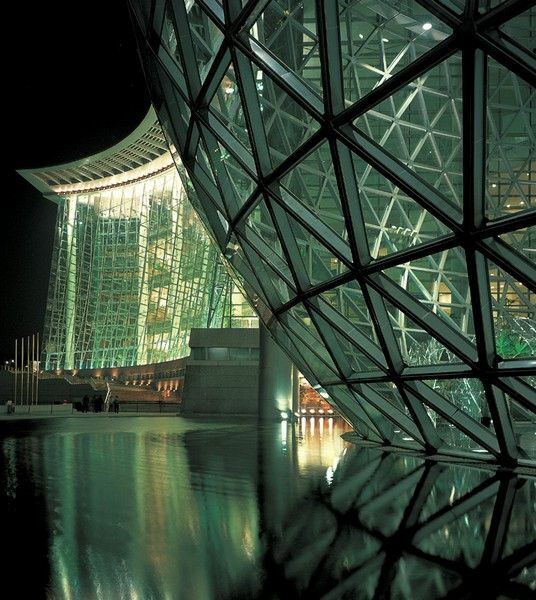 The green land is surrounded by clusters of high buildings which are like a new International Architecture Expo. 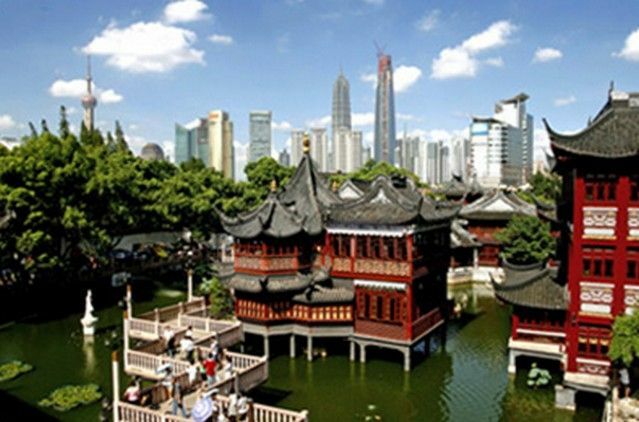 Towards the south of the Lujiazui Central Green is the Lujiazui development Exhibition Room which showcases special architectures and combines Chinese and Western culture. 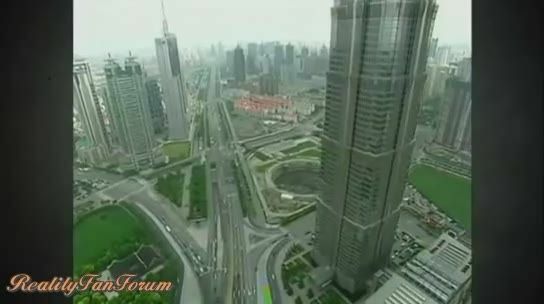 It also reveals the past present and future of Lujiazui. The park is open from 6AM till 10PM. This location may include something to do with Cadillac Escalades?? assemble toy cars?? Cliimbing?? product placement?? Not clear... possibly originally scheduled for Da Ning Park instead. Whether this is Eating? Selling? Cooking? is unknown. Teams then travel by taxi to the Riverside Promenade and search on foot for the PitStop for this leg. We were very fortunate that Slowhatch found a wonderful blog written by swoonist, who is currently working, living, and studying in Shanghai. 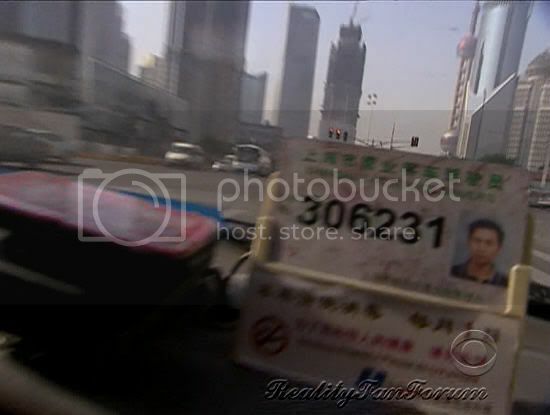 We spent one day doing the touristy things of Shanghai. We went over to Lujiazui to see the Pearl Tower and to go up the Shanghai World Financial Center building - currently the third tallest building in the world (according to wiki). It’s the one that many of us think looks like a ‘bottle-opener’. After wandering about Lujiazui for a bit and grabbing a late lunch at Din Tai Fung, we eventually made it to the Riverside Promenade so that we could get a look across the river to the Bund on the Puxi side. We are standing around in the freezing cold, next to the freezing cold river when THE MOST AMAZING THING HAPPENED! 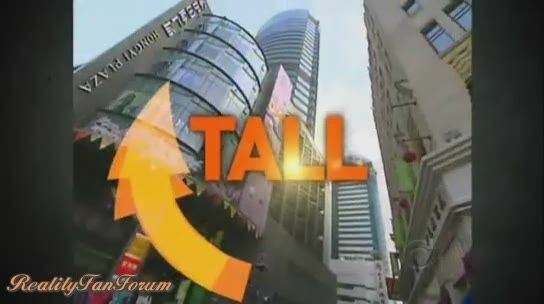 2. see one of the world’s tallest men. He’s a Chinese man and quite tall. Though I heard soon after that he just recently lost his title to someone else. He needed walking canes to help him stand though. 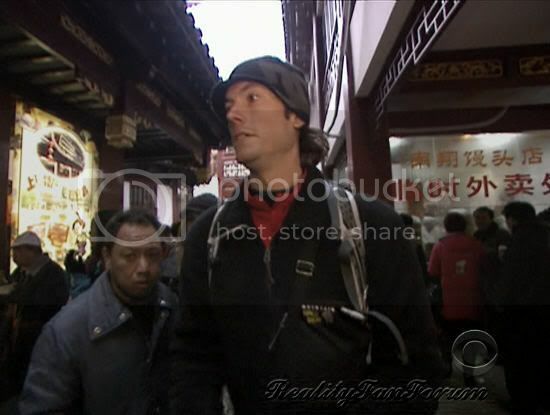 3. see the production crew of The Amazing Race. 4. see Phil, the host. 5. say “hi, I love this show” and get a photo with Phil. The crew in charge of keeping the area clear of bystanders was nice enough to let Michi and I stand around. I believe they let us because they could tell we weren’t locals from our American accents and probably figured we could do no harm. Truth is, some Chinese locals will treat you differently once they know you’re a foreigner ... even if we are ethnically Chinese. After that cold, amazing experience, Michi and I headed across the Huangpu River back to Puxi where we grabbed some dinner and took a walk down Nanjing Road. It’s just a shopping street but at night it’s all lit up and you can people watch. Weather: still cold. credit for all of this goes to swoonist, with a big from all of us. 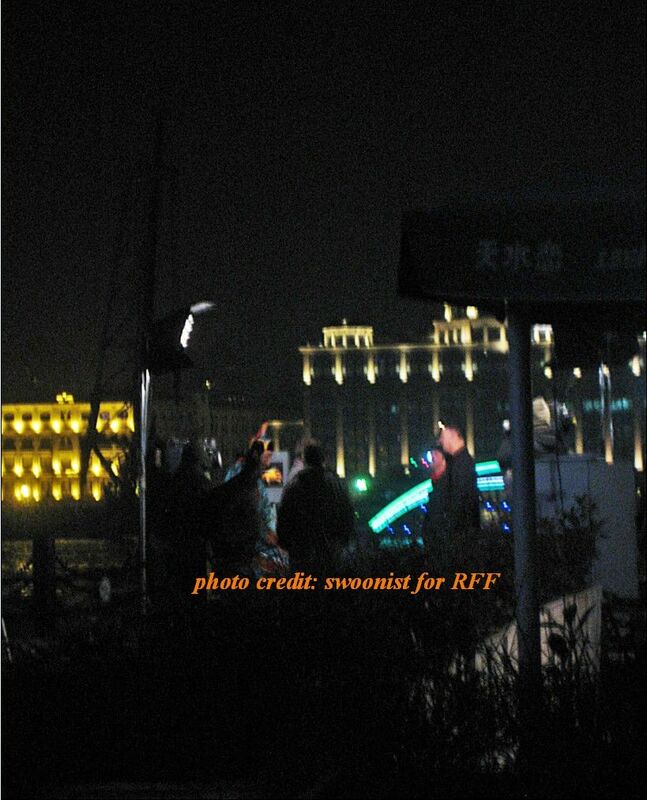 The Pit Stop was on the Pudong side of the river (Lujiazui) along the Riverside Promenade. 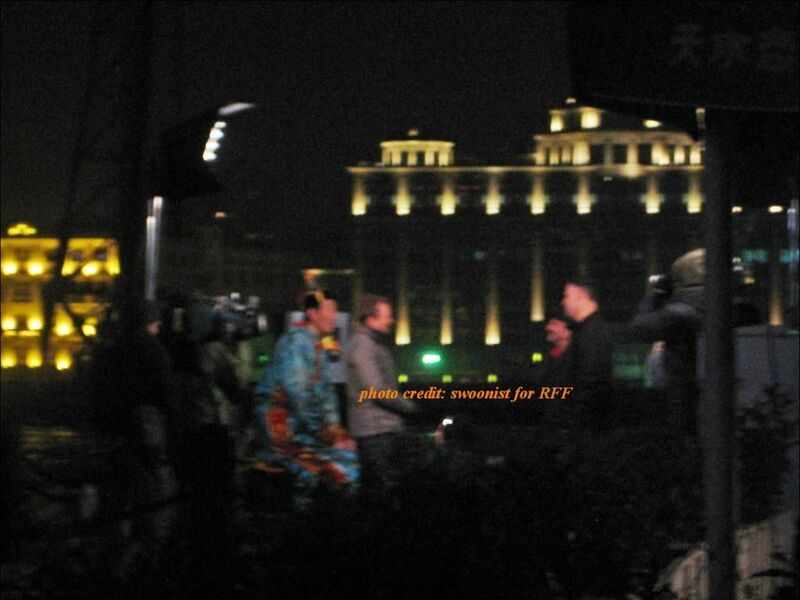 The exact location was the area that is directly in front of the Starbucks and Shangri-la Hotel. 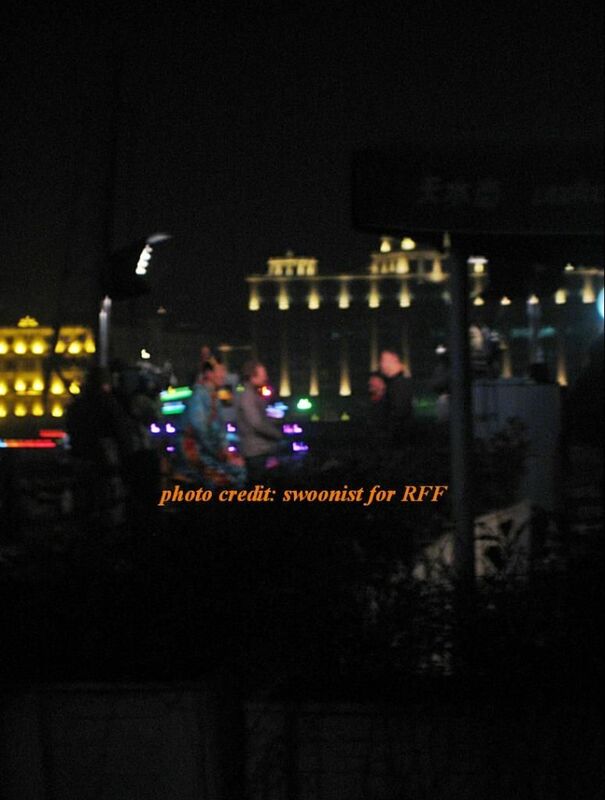 I saw them on Saturday, December 19 around 6pm-8pm (China time). 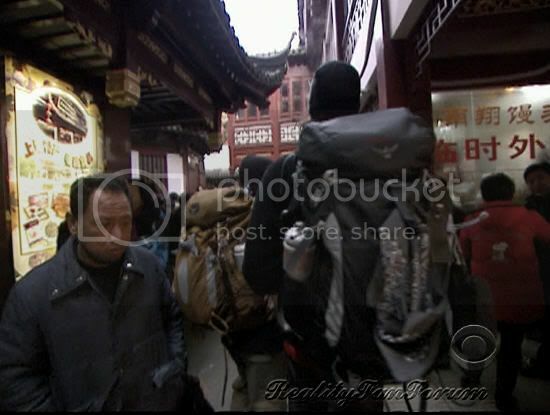 The tall Chinese guy was the greeter. The first was taken in between the second to the last team and the last team to arrive. And the rest were pictures of Phil talking to the last team to arrive. All photos were taken after the second to last team had already checked in and left the area. My friend and I ran up to the area just as the second to last team were hugging each other and speaking to Phil. I dont have many pictures to show because they initially refused to let us take photos. ........ So I was only able to get pictures of the last team to the Pit Stop. In the photos, you will see the Chinese greeter (in full costume), Phil, and the male/male team that I think is Louie and Michael (tall and short males). The photo was taken just before the last team arrived and after they had "checked-in" and Phil has that short conversation with them. Swoonist was also able to confirm the next to last team as Dan and Jordan. The last 2 teams to check in were both male/male teams. Judging from the CBS website of the cast, I would say that the second to the last team was Daniel and Jordan and the last team was Louie and Michael. The second to the last team to check in were male/male and they weren't wearing cowboy hats (my assumption is that the cowboy team wears their hats throughout the race? I have no idea, haha). This second to the last team actually ran past my friend and me, but they ran in the wrong direction because a few minutes later they doubled back in the direction of the Pit Stop. The last team to check in was a tall male and a shorter male. They arrived at the Pit Stop almost 2 hours after the team before them. It seemed like Phil talked to the last team for quite awhile. The arrival order was later confirmed by our local insider as Cowboys, Models, Brothers, and then sadly, Michael and Loiue eliminated. Cowboys apparently arrived about 2 hours ahead of the Cops. While they were waiting for the team to arrive, Phil would help hold up the protective covering to keep the Chinese greeter warm. Since the Pit Stop was right next to the river and it was a really cold winter night, there were a few helpers who would help cover the greeter (probably not in perfect health due to his large body frame) from the cold. 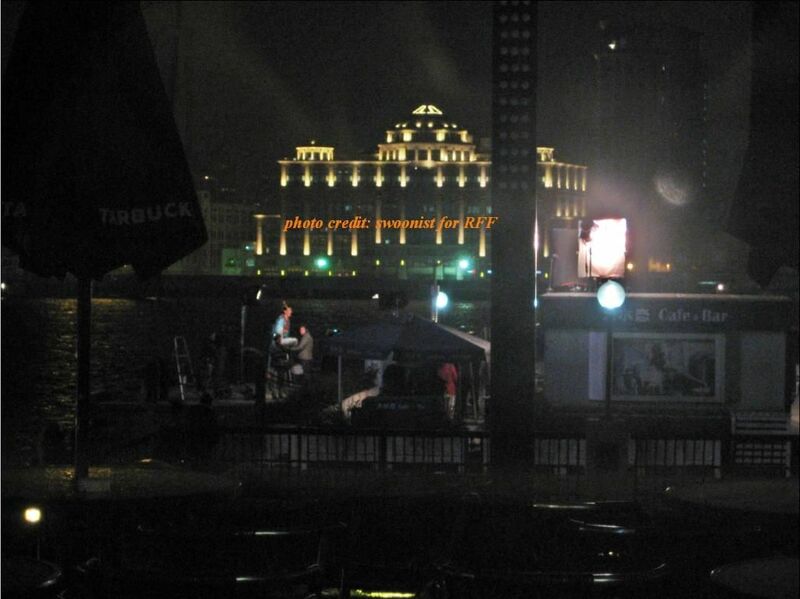 The buildings behind them are part of a group of buildings known as "The Bund" in Shanghai. They are located on the Puxi (Western) side of the Huangpu River. So the brightly lit buildings you see are across the river. There should be information about them on wikipedia. The Pit Stop was on the Pudong (Eastern) side of the Huangpu River in the Lujiazui area (where the Oriental Pearl Tower, Jin Mao Tower, the Shanghai World Financial Center and Super Brand Mall are). I see something here, across the river from the starbucks; it has a similar shape, but the name translates only as "new bund building." It's south of the Mcbain building. Look at the building with the cupolas next to the Attica nightclub. Russo-Chinese Bank Building (No. 15, The Bund) is now the Shanghai Foreign Exchange. Here's the English and translated Chinese version (click the thumbnail to enlarge). It's not big enough to be listed with Emporis, but I found a streetview for you. And here's a shot of the Starbucks taken from the ShangriLa hotel. Do we see Jaime or Cara in this eppy? Judging from the title, I think we're in for another series of language butchering in this ep. I'm wondering if we see Jaime in this episode myself! Shesh... Shanghai is more than 600 miles from Beijing. 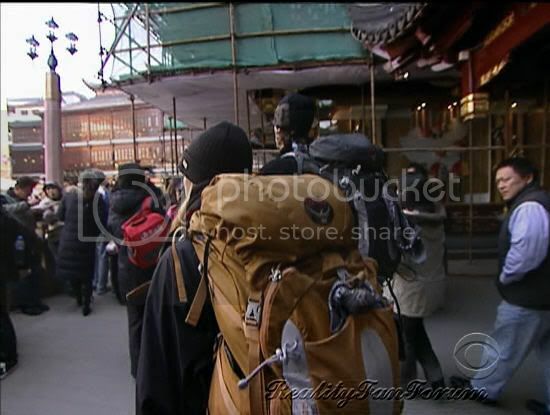 Jamie and Cara were not THAT lost. I think uycocoa was referring to the title...like how Jaime and Cara were complaining how no one understood them and how they struggled with the language barrier. Sounds like Brent to me... like his "I quit" in Seychelles. I know, I was just teasing him and Belle Brook. I don't think many people will be complaining about the speed bump now... it's definitely much harder than serving tea. The title suggests a situation like when a team does not know the place, they ask some local to give direction to their taxi driver but still they end up getting lost. Leg summary updated in post #2. I wouldn't be surprised by any of the four teams saying it, but I'm going to guess Dan & Jordan for the title quote because they were the ones who criticized the people of France for not speaking English to their liking. They are heading to the food stalls in the Bridge of 9 Turns, I think. 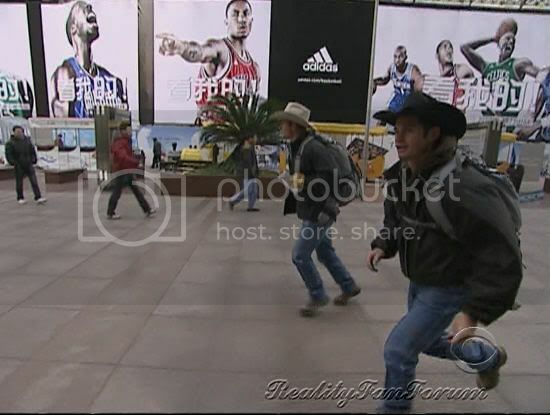 hmmmm... appears that "The Boyz" are in Shanghai's Century Park running towards the Space Science Museum... Huh!?! That is funny! Wonder why? But it is the Science Museum, right? Now, to figure out why?? Yeah, but I don't exactly know what so good luck about the coin toss... I mean, off topic here, but didn't Joe & Bill won it, and ended up like a LONG way behind the other teams? That was their fault. Instead of heading for the Pit Stop, the decided to "Sip ice tea in air conditioned splendor."